You know the feeling. You’re in a foreign city that for you is rich with depth and mystery. Maybe you’ve wanted to go there for years and when you get there you’re affronted by ramparts stacked with silly souvenirs, often made in China, that make your love for the destination seem silly and cheap. That’s bad for you, but imagine how the local people feel when they see tourists buy something silly and banal as their future talisman to help them remember their town. How do you think that makes them feel about tourists? It’s a vicious cycle. Authenticity is a critically important element in travel. 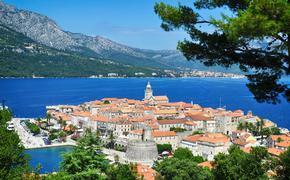 Every region is distinguished by its history, its religions, its foods and its attractions. It’s also defined by the things it makes and makes with pride. If possible, why not take something real home to remember the place by? Authenticity is just as important in the keepsakes we purchase as it is in the food we eat there or the experiences we seek. Few regions in the world are as rich with products made with pride of place than Southeast Asia. Last winter, Hanoi announced plans to help six different villages that had long and deep connections to traditional crafts incorporate tourism. The idea is to contemporize the marketing of traditional products in a way that helps those villages sustain the crafts they’ve been making for eons. We are beginning to see some of these programs come to fruition. Two of these villages, Bat Trang and Van Phuc, have displayed a mastery of ceramics and silk, respectively, crafts more associated with China. China and Vietnam have a complex relationship. Politically the two countries are often at odds over territorial claims (as in the current Spratly Islands dispute), despite that much of Vietnam’s most beautiful cultural expressions have roots in China. Even the classical city of Hue owes much to Beijing’s Forbidden City. 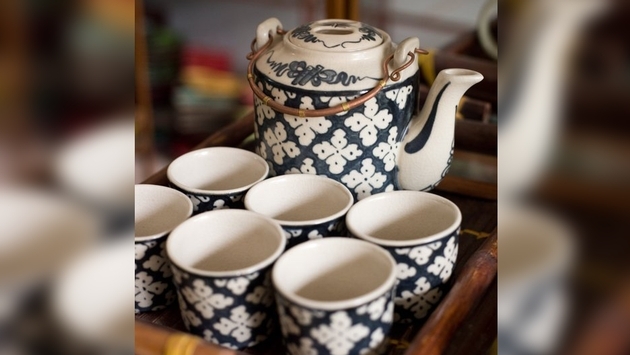 Some of Vietnam’s crafts originate in China. Bat Trang is an ancient village famous for the quality of the ceramics and pottery it makes. The village has become a popular place for day trippers from Hanoi to visit on weekends as it’s only seven miles southeast of city center. Known for the beautiful vases, bowls, dishes and other ceramic goods it produces, Bat Trang is also known for the antiquity of its roots as a village. Some say the village originated in 1100 when three Confucian scholars returned from China where they acquired the skills of pottery making. And so they brought back an understanding of how to perform one of China’s most signature arts. It helped that Bat Trang’s white clay was ideal for pottery. Bat Trang ceramics are generally thicker than Chinese and feature their own designs. One more thing that distinguishes them is their glaze, which is of high quality. Silk production goes back some 2,000 years in Vietnam and like ceramics, it is more than a mere product; it symbolizes Vietnam’s very rich cultural ties to China. The village of Van Phuc produces 2 million meters of silk every year and it produces them on a house-by-house basis. Of the village’s nearly 1,300 households, some 90 percent produce silk and almost every house lining the roads throughout the village also doubles as a silk shop. Like Bat Trang, Van Phuc is a short ride from Hanoi. Shirts, ties, dresses and many other things made of silk are sold in the village. Van Phuc silk is known for its lightness and fluidity. It also has the ability to receive a greater variety of dye colors than most silks. Other villages are also being incorporated including a village that specializes in rattan and bamboo weaving; a fine art culture village; a mother of pearl inlay village; and a sculpture village. Down the road it’s hoped that homestay options will make it possible for visitors to get an insight into village life and try their hand at creating handicrafts. By 2015, Hanoi aims to establish a further 14 other tourist villages which are expect to boost the number of international visitors to 500,000 and domestic tourists to 3 million. A variety of fabrics are on display in four distinct sections of the museum, from silk to cotton and even one Indian carpet that’s woven with strands of silver. The museum’s four galleries include the Orientation Gallery, the Material and Process Gallery, Traditional Textiles and finally Contemporary Trends. For children and others who may be interested there is an interactive work station where they can try Indian block printing onto white fabric. There are also plans for an on-site training center in the future, as well as a shop. Ock Pop Tock, a second boutiques recently opened in Luang Prabang dedicated to the production of traditional Lao textiles. The store sells textiles made either in Luang Prabang or at its Living Crafts Centre, in collaboration with rural Lao artisans through the company’s Village Weaver Projects. A variety of textiles are on display each coming with motifs crafted from generation to generation by local master weavers to give an insight into the culture and history that influence the designs. Both traditional and more modern designs are featured in the showroom and include intricate wall hangings, silk scarves, pillow collections and also showcases its latest range of modern hemp and cotton garments designed for both men and women. In neighboring Thailand, the Tourism Authority of Thailand (TAT) is encouraging tourists in Chiang Rai to visit the hill tribe village of Doi Tung and its 52 Rai Production and Distribution Centre of Handicraft Products, a program initiated by the late Princess Mother to improve the lives of hill tribe people. Many of the handicrafts for sale are traditional products such as hand-woven textiles and clothing, handmade carpets, ceramics and Sa paper.